"Maybe I'm not fast enough." Captain Cold and the Golden Glider return looking to Barry, Cisco and the team for help while Jay Garrick searches desperately for a way to get home - and prevent Zoom from gaining any more power. That opening rocked my superhero vibe, and I was thinking "He's almost there, isn't he? He's almost a legend already." He got the call from Iris, talked her through what needed to happen, and he was there to save her, take the guns from the bad guys, and flash back home. There's a part of every hero's journey where their powers are mastered or nearly mastered. At this point, what happens? The hero emerges from training, leaves their teacher, stops being an apprentice, goes into the wild. Often at the end of their training they may have to fight their teacher for the right to leave. Whether they win or no, they face a period of self-reflection where they re-assert their understanding of the world. Then there is, usually, a moment of peace before the wheel keeps moving on. But now it's a different wheel, and they're learning, not from teachers, but from peers, from people the hero meets, from equals, from those who grew up with them who start to reach a maturity of their own. 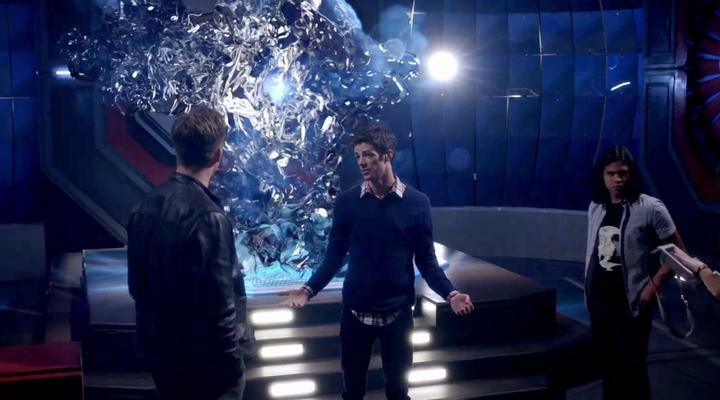 I think Barry's moment of peace lasted for a couple minutes at the beginning of this episode. Jay Garrick's storyline started to make more sense to me, and Jay-as-scientist works. The slightly desperate Caitlin is getting to the annoying point, but I myself make no promises as to what would happen if a superhero/physicist showed up in my laboratory in a tank top. She and Garrick do have nice energy. I'm not entirely sure it's a mistake that Martin Stein starts turning to Firestorm while massive embarrassing flirting is occurring. For now, he looks like he'll be part of the team a little longer. So many people were asking about Iris' mother last season that to see the show seriously address the issue–and in a way that gave Iris the opportunity to shine and grow instead of whine–felt gratifying. 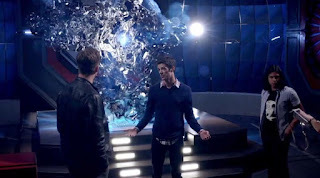 Joe's choice was a difficult one to make, and I think a year ago Iris would have reacted the way she did to Barry and others–petulant, unhelpful, and self-centered. She's matured, and I for one give kudos to Candice Patton, and this show focuses on that maturity. The scene between her and Jesse Martin had sentiment, but was not sentimental, and they came across as rock-solid Dad and daughter; on top of his earlier visit to her workplace, it just felt totally lock and key. And while I love Caitlin, her move away and the loss of Ronnie has clearly changed her relationship to the team, allowing Iris to fill more of a support role for Barry. I'm hoping the show deals maturely with Francine and the issues of drug addiction. Waiting to see on that one. The only off-note about the entire episode was the stupid bombjecting glow pen detonator thingy Lewis Snart was using. It was corny without being rewarding. And if he's able to rig up something on that level, why would he need a tech guy? It's bloodthirsty of me, but I was actually fairly happy Cold killed him. (I was also into Cold's emoting at his father's death, but then I'm partial to Wentworth Miller.) I think it's a Flash rule. Everything in the show has to be perfect except for that one corny thing that tells you it's Flash. And I can live with that, ladies and gentlemen: I can live with that. The big surprise - Harrison Wells coming through the gateway - as Zoom? - as another version of Wells? - as another version of Eobard Thawne? - I clearly have more questions than answers. Will Martin survive these attacks to his system? Will we find out why the flame was blue? I have a feeling Ronnie's in Jay's world somewhere after getting partially sucked into the Singularity, and maybe he's in the same place or something and they're resonating. After all, don't universes have vibrations? This is the third week we've seen bad guys die. Not quite as bad as Gotham or Arrow here, but Flash is definitely taking a darker turn this season. The bad guy wears black, too. I was really grossed out by Cisco's neck bomb removing gun. Enough said. The thing I love about Grant Gustin is how, despite the fact that he shares so much screen time, he carries the storylines from behind. Iris would be dead in her hunt for the perfect story without him. Joe would be dead multiple times, and Joe's now going to Barry for advice. So are the criminals. Even Jay Garrick and Martin Stein, both powers in their own right, have a great respect for Barry Allen. And I haven't forgotten that scene from the Arrow in that show's season opener where Barry apparently comes to emotionally support Oliver. I once questioned whether Gustin could pull this off; now I can't see anyone else in the role. 4 out of 5 hokey lighter neck bombs I can attempt to embrace but can't quite forgive. I love Wentworth, too, and he got some good stuff to do here. I watched several more seasons of Prison Break than I would have if someone else had starred in it. 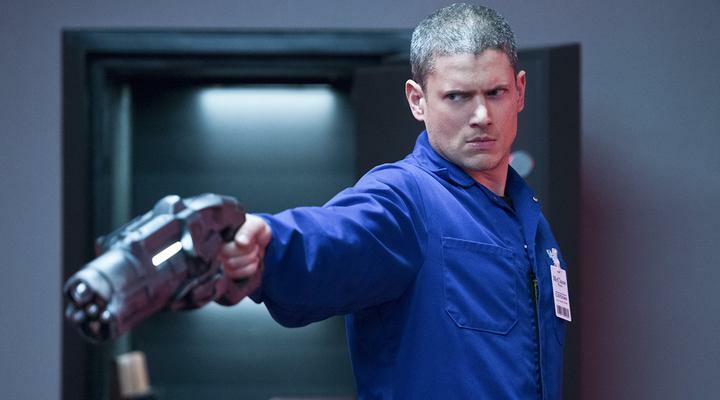 Yes, Wentworth Miller is a male femme fatale. Did you see him making eyes at Barry from the other side of the glass at the end? It was awesome. I think i might be the only one who remembers smallville fondly... 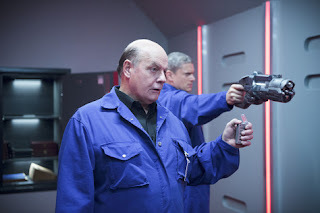 But it was nice to see Michael Ironside and Peyton List be father/daughter again even though they didn't share any screen time.. Flash and arrow really going well this season.. I was very bothered by the way the situation with Iris and Joe played out. I get why Joe made that choice long ago, even if I’m still debating whether I think it was the right one. But I think Iris should still be struggling with it, too. It just doesn’t ring true to me that she would learn her mom was still alive and that her dad had lied to her her entire life about things and just immediately accept it and forgive him. I mean, he didn't just lie about her mom being dead, he apparently made up extensive stories about what a great mom she was! I can absolutely see Iris coming around and forgiving Joe eventually, but this is a terrible shock and a HUGE betrayal of trust. Far worse than everyone keeping the Barry/Flash secret last year. I feel like a much more realistic (and yet still mature) reaction would have been for Iris to take the information in and then leave, calmly telling her dad she needed time to process everything. Then go seek outside counseling. A reveal of this magnitude should have ongoing consequences, and I’m really hoping that Joe and Barry patting each on the back for the “job well done” isn’t the end point for that story thread. Jess, I agree that her acceptance of the fact that her mother is alive, and may not have been as good a person as she was led to believe. Though to be honest I prefer this to the other unrealistic option, her turning on her father for keeping such a big secret all these years without stopping to consider his perspective. Maybe I'm just not very bothered by her calm reaction because I'm not very excited about this particular storyline to begin with. One of four things will turn out to be true with Iris' mom. 1) She really has turned around and will be completely humble & contrite and will give Iris as much space as she wants. In other words, a snooze-fest. 2) She's turned around, but thinks she's somehow entitled to waltz back into her daughter's life, because her biological connection trumps her past bad behavior. Seen it. MANY times. 3) She hasn't really turned things around, and she's going to slip back into her bad habits. Seen it. Don't want the distraction. 4) She's got some kind of sinister ulterior motive for returning, possibly at the behest of some villain working in the shadows to try and get close to Iris and thus get close to The Flash. Potentially the most interesting option of the bunch, but since it's the only one I'd be REMOTELY interested in seeing, I'm going to be on the lookout for the big twist and as such won't be surprised when it happens. On the other hand, the Snart family dynamics were much more interesting in this episode. I'll be curious to see what they do with Lisa when Leonard & Mick move over to the new spin-off(if you follow this show and that's still a spoiler for you, you REALLY haven't been paying attention). She's established enough of a rapport with Team Flash(are they a large enough group to call them the Flash Mob?) that she could conceivably appear in an episode without her brother. Plus, Peyton List seems to have a good relationship with The CW. I'll certainly never say no to more of her on my screen, but may just be my inner caveman talking. Barry got to showcase some very impressive Flash tricks in this episode. Sure he's sorta done some of this before but it still made me smile like a moron nonetheless. I love that even though Barry has some of that young naivete and hotheadedness, he thinks fast on his feet a lot (hey-o!). His slight turn as the techie braggart was very amusing to me. And Barry and Cold's face-off in the office building tickled my funnybone. The way Wentworth Miller plays Cold is great. I'm with Patrick with the mom storyline. Hopefully they make it work. Though consider this option. Maybe they made Iris react this way so she wouldn't turn out to be another Laurel. People were already getting tired of her antics all throughout the first season, and she's made great strides in winning over the audience (unlike Laurel, who's taken a big step back in my opinion). I myself don't think i could take yet another story where the headstrong character throws a tantrum over secrets kept from them. I get where you guys are coming from, and I’m not particularly thrilled with any of the prospects for the Iris mama drama either. I definitely don’t want to watch Iris have a tantrum and a long-term massive falling out with Joe, but at the same time this isn’t just any secret that was kept from her. It was a really significant one, and part of a pattern of behavior with Joe lying to her supposedly to protect her (consistency, yea?). I’m just hoping they’ll allow her room to really express and respond to the pain and confusion she’d likely be feeling. Instead of just giving us the whole thing from Joe’s perspective and making it all about his pain, fears, and relief (like they did in this episode). Plus, I think it really grated my cheese this week because, for me, the way they handled her response fed into the larger pattern of the female characters not being particularly well served in this ‘verse. All the ladies largely seem to be there to worry about the men or be “protected,” “saved,” or “coveted.” Or be used as pawns to control their men or as victims to cause their men pain (likely due in part to typical superhero comics tropes). I know bringing up the gender issues in these things can lead us into dangerous discussion waters, but consider this week: Iris got all kinds of kudos for breaking a big story, but what we actually see is her getting herself into trouble and needing to be saved by Barry. We also see Lisa Snart being victimized, used as a pawn, and needing to be saved by Cisco. Plus, we learn about past abuse that another man (her brother) saved her from. Patty was basically just there as a new potential love interest for Barry. And then there’s Caitlin --- often presented as a smart, capable woman --- whose storyline this week pretty much consisted of her fretting over Dr. Stein and fawning over a cute boy with similar interests, even though her husband just died 6 months ago. Oh well. Time to move on, I guess. Jess, feel free to discuss those issues here. I had a mini-rant about the same thing in Gotham in my other week's review, and I certainly think you have a great point here. That's part of why I find the Caitlin thing so annoying - she's professional and powerful and she just seemed so reduced in this episode. Iris/Barry and their relationship I'm willing to accept some give and take - she was the one shown replacing Wells in giving Barry support and guidance, after all - but I find myself agreeing at least partially with you about Iris/Joe. I'm hoping the concept of *when* it's okay to be a savior, and when it's self-serving, becomes part of the plot going forward. Brilliant review. Yeah season 2 has me hooked. I was worried they had too many plots dangling but they seem to be regaining focus.